Sarmad A. Ali is the Managing Director (Marketing) of the Jang Group, Pakistan’s largest media conglomerate having interests in print, broadcast and the internet sectors. Sarmad has over twenty-five years experience in marketing, advertising and media management. He has been associated with the Jang Group since 1994 when he joined the group as Chief Operating Officer of The News. Under his stewardship The News became one of Pakistan’s two premier English dailies. In 1997 he took over as the Group’s Executive Director Marketing & Sales and in 2006 was promoted as Group’s Managing Director Marketing. Prior to joining the Jang Group, Sarmad had been associated with some of the country’s leading advertising companies including IAL/Saatchi, where he worked as Director Client Services from 1987 to 1993. During his association with IAL, it became the second largest advertising agency in Pakistan and entered into affiliation with Saatchi & Saatchi. At IAL, he was part of the team that launched Procter & Gamble into the Pakistani market place. Described as of one of Pakistan’s marketing thought leaders, Sarmad has been thrice the President of Marketing Association of Pakistan. In 1999, he was awarded the coveted Marketing Excellence Award for his contribution in the field of marketing. He has also received the acclaimed Asian Brand Leadership Award from the World Brand Congress. 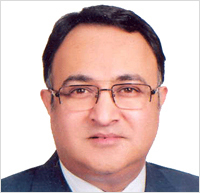 He is presently Secretary General of All Pakistan Newspapers Society (APNS). He is also presently President of the International Advertising Association’s Pakistan Chapter and serves on IAA’s global Board of Directors. He is also Council member of the Management Association of Pakistan. He has also served as member of the Prime Minister’s task force on Privatisation and Investment in 2003 and as member of the Sindh I.T. Board from 2000-2003. He has served on the Board of Governors of Worldwide Fund for Nature Pakistan (WWF-P), and is currently on the Board of Consumer Protection Society, Care for Children Trust and the Friends of Burns Centre. He holds a Masters degree from Villanova University, Pa, USA.